It was May 22, 1918 in the midst of the First World War that twelve dedicated Armenians in Fresno, California took their oaths to form Yeprad Tahlij #9. These men became the charter members of a national brotherhood that had been formed just two years prior in Philadelphia, for the noble purpose of alleviating the suffering of the oppressed Armenians who had been torn away from their native homeland in the midst of a great Genocide. The new lodge was launched by the Avak Sbarabed, Rev. Haigaz H. Khazoian, the first Avak Sbarabed. Out of the twelve new members a Tivan was elected and Arsen Diran was called to lead as the first Sbarabed of Yeprad Lodge. From its very first days, Yeprad showed zeal and intense interest in carrying out its mission. Even by 1920 it had underwritten the travel of a delegate to the Peace Conference at Lausanne, France. The Tahlij followed quickly, two years later, to seek concern in the California State Senate with Armenian affairs. In a similar sphere, Yeprad played a significant role in ameliorating the anguish of discrimination against Armenians in the Fresno vicinity. Yeprad Lodge has encouraged and supported joint meetings between the Apostolic and Protestant communities with the goal of attaining enhanced harmony. 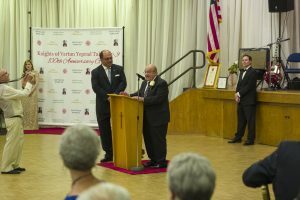 On May 5, 2018 in celebration of its 100th Anniversary, Yeprad Lodge held a banquet at St. Paul Armenian Church Haig Berberian Hall. Under the capable leadership of then Sbarabed Ara Karkazian a program befitting 100 years of service was held, with 240 members and friends in attendance. Honored that evening were Nakhgin Avak Sbarabed Bob Der Matoian along with Nakhgin Avak Dirhouhies Barbara Garabedian, Chris Krikorian, Sara Der Matoian, Adeline Arakelian, and Melene Ouzounian. The evening was capped off by dancing with music by NS Richard Hagopian and his band and DJ Asbed Armen Postoyan. The proceeds from the banquet will go to the mission projects of Yeprad Lodge, most recently including the renovation of a Kindergarten building in the village of Tegh.